1. PRICE! Nearly a third of any high end gun and shoots just as nice! 2. Memorizing colors for board settings. 3. Feed neck is decent but worth upgrading. First off I have been shooting the Empire Axe Paintball Gun for almost two full seasons now and have had very few to no issues at all with them and have enjoyed shooting them! 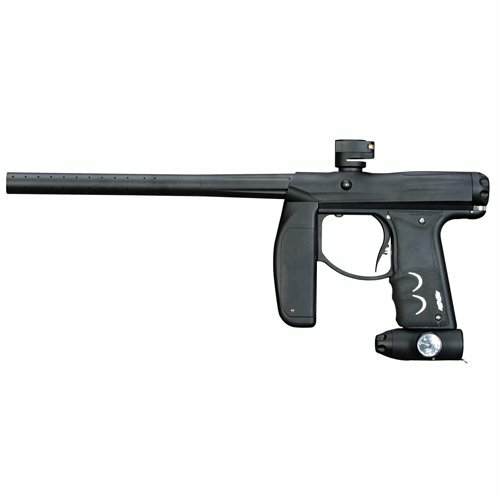 Previously have owned and shot Planet Eclipse paintball guns and Dye paintball markers and coming from these lines I had pretty high expectation for markers. I honestly did not believe that a gun with a price as low as the Axe would shoot as good as it does, but after using it for one weekend I was wrong! First thing I did to the axe when I got it was putting it in psp mode, which was a little confusing at first because I did not have the colors memorized so I had to look it up on the manual. So other than changing the firing modes I am using completely stock setting with no problems. I think right out of the box I was getting right around 7 pods and a hopper off a 70/4500 tank, and now after breaking the axe in I am getting about 9 pods and a hopper off a 70/4500 tank. So with that said the axe is more efficient than most dye guns I have shot but not quite as efficient as the egos I have shot. But who honestly shoots 12 pods in 1 point? Next was the smoothness of the shot which I was pretty spoiled on coming from the dye marker line. The first couple of shots actually kicked a lot! Then I realized when I shot the marker over the chronograph that it was shooting 320, so I turned the speed down to 280-290 and then it shot pretty dang smooth! It was pretty chilly for Houston that day (low 60âs lol) and I did not break a single ball all day so on top of being efficient and smooth, the axe is really gentle on paint! When I got home that night I wanted to see how easy it was to clean the axe. Turns out its super easy, with the push of a button and the twist of the back cap, the whole bolt system comes out, easy as that! A Major thing I liked about the bolt system is the fact you cannot mess anything up in less you but the bolt spring on backwards. So in the rare case you have to pull your bolt system out on the field it is easy and there’s no way to mess up the gun even if you are rushing. So after shooting this gun for as long as I have I would recommend it to ANYONE who wants a gun that’s efficient, smooth, gentle on paint, durable, reliable, and all around a straight shooter.